JEDDAH, 29 December 2007 — A prominent Indian scholar has called for an effective campaign to counter extremism and suicide attacks. “Suicide bombings are against the basic principles of Islam. They are anti-Islamic. We need to enlighten Muslims about the negative effects of extremism,” Sheikh Aboobacker Ahmed alias Kanthapuram A.P. Aboobacker Musliyar, secretary, All India Jamiyyathul Ulema, told Arab News. He also reminded Muslims that their actions must be motivated by the love of Allah and His Messenger Prophet Muhammad (peace be upon him). Sheikh Aboobacker urged Muslims to refrain from activities that might create misunderstandings among non-Muslims about Islam. He said extremism and suicide attacks would not resolve any of the problems faced by Muslims. He said it was wrong to blame all Muslims for the evil activities of a few individuals. “Miscreants are found in every society but the entire society cannot be held responsible for their misdeeds,” Sheikh Aboobacker said. He accused the media of tarnishing the image of Islam by generalizing wrong actions of a few. Sheikh Aboobacker commended the Saudi government for the excellent arrangements that culminated in a very peaceful and smooth Haj. 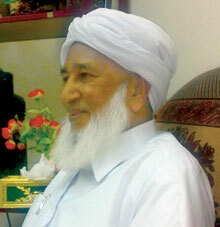 Sheikh Aboobacker is also the general-secretary of the Markazu Ssaquafathi Ssunniyya, a non-profit educational institution based in Calicut, Kerala. According to the scholar, the Markaz plays an important role in the reawakening of Muslims in Kerala by imparting religious and secular education simultaneously. The institution offers shelter to a large number of destitute children, especially orphans. “Providing care to the helpless and needy is the thrust of Markaz activities,” he added. A total of 8,000 students are studying at the Markaz including 1,500 orphans. They come from different parts of India, including Kashmir and Hariyana. Sheikh Aboobacker said the material and moral support from the community helped the institution reach its present level of excellence. The Markaz runs 25 institutions including Shariat College (that teaches Qur’an, Hadith and Fiqh), English-medium schools, orphanages (for both girls and boys), arts and commerce college, college of technology and Tahfeezul Qur’an College. “Preparations are under way to launch professional courses such as MBA, BBA and D. Pharm,” he said. The Markaz also runs a number of polyclinics and hospitals aimed at helping the poor. Markaz’s website www.markazonline.com can be accessed for more information.